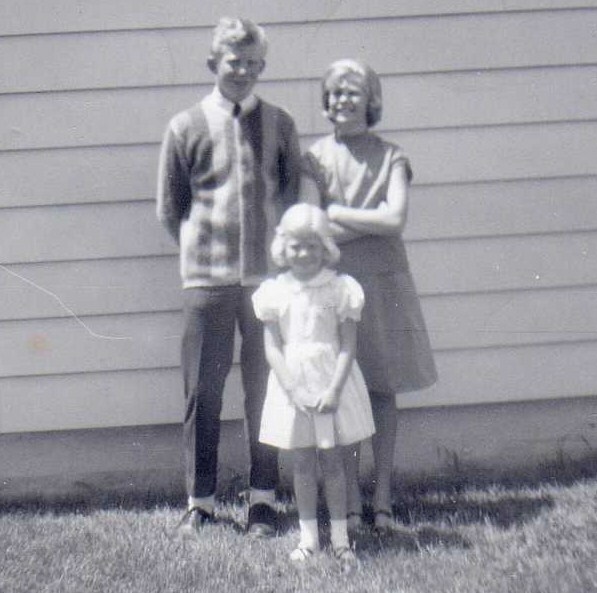 For my Mother’s birthday, I thought I would share a few thoughts about her. I know she is pretty maligned by some, praised by others, and many more just do not know what to be in relation to her. Therefore, I thought I would talk about her with that title, Mother. The above photo came to me in 2010. 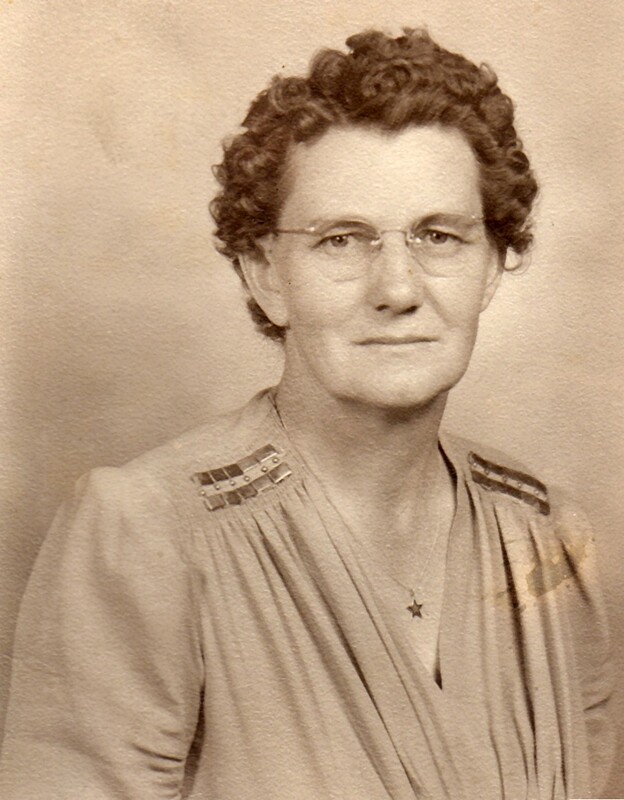 This photo was given to my Great Grandmother, Lillian Coley Jonas Bowcutt (1898-1987), probably not long after it was taken. 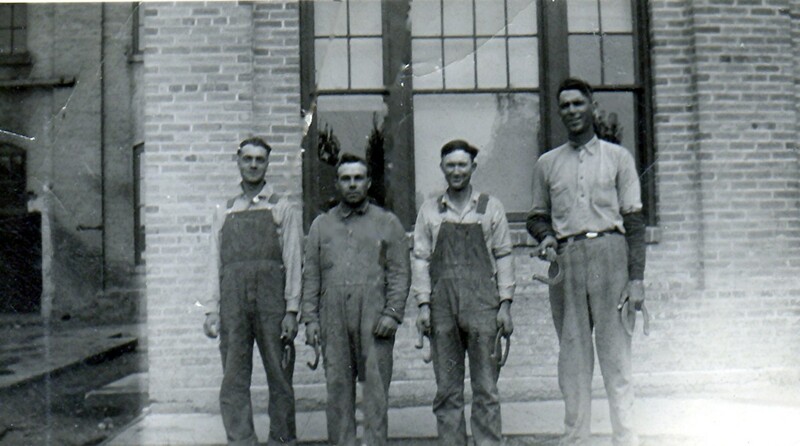 I am guessing before 1960. 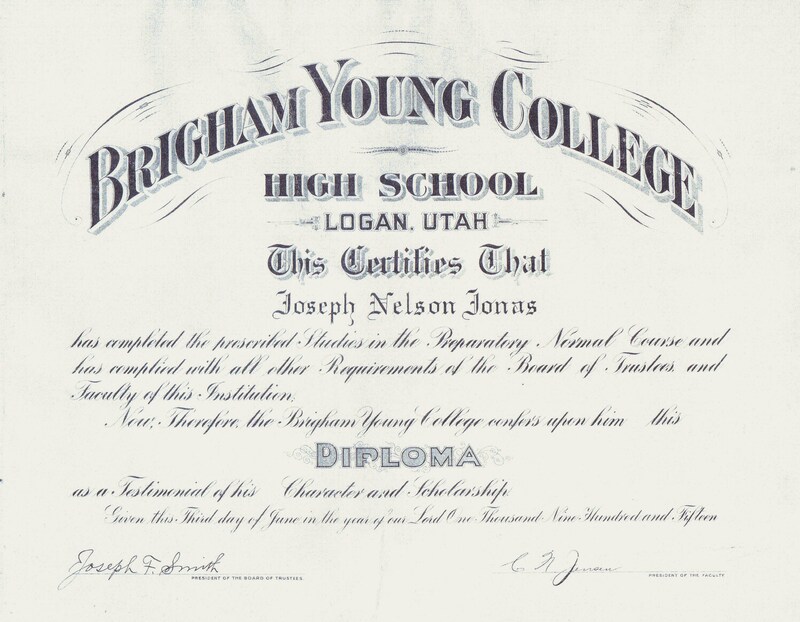 From my understanding, it hung on the wall of my Great Grandmother in Richmond, Cache, Utah until she had to move in with her daughter, Lillian Jonas Talbot (1930-2009), in Layton, Davis, Utah the mid 1980’s. It still has its original heavy paper frame and original glass. 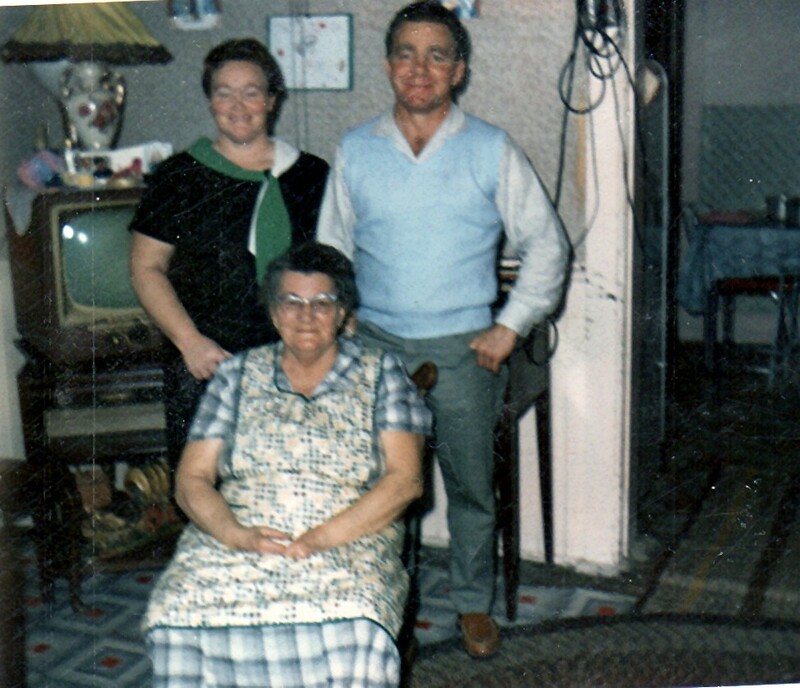 I took the picture out of the frame to scan it and imagined that it was the photographer who placed it there in the late 1950’s, or more likely, one of my grandparents. 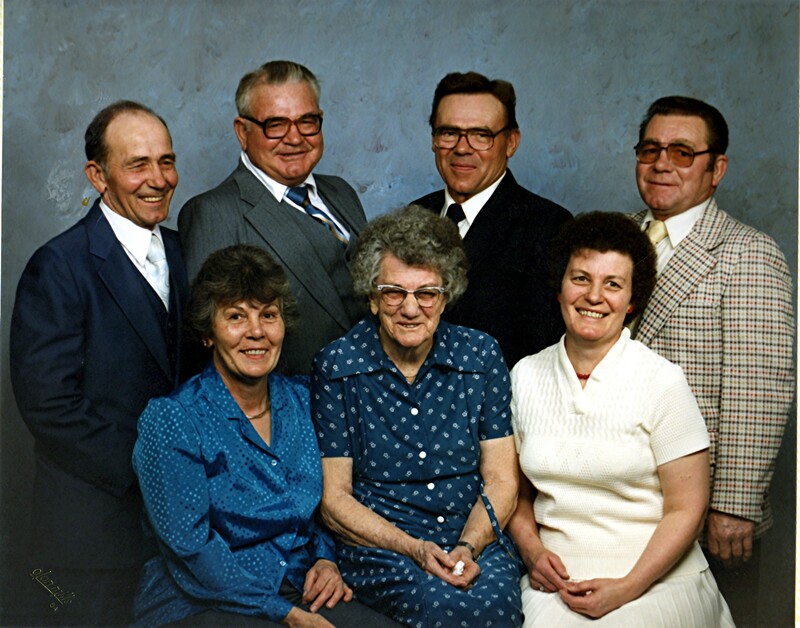 I can imagine the photo carefully located on Great Grandma’s wall and the love that swelled in her breast as she viewed my Mother and my Uncle Doug. 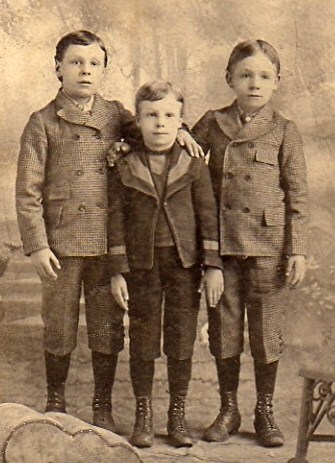 I am sure the scores of other grandchildren hung on the same wall, but these were grandchildren that also lived in Richmond and paid regular visits so there was a personal love as well as that motherly love. 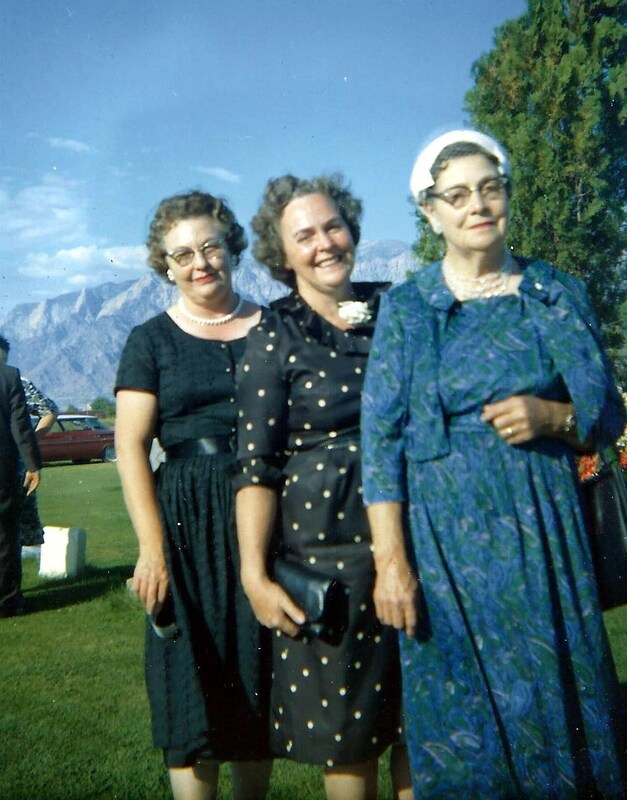 When Great Grandma Lillian moved to Layton, all her photo albums and pictures went with her. 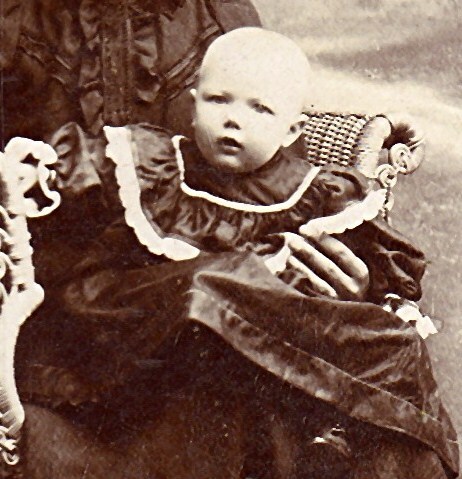 When she passed away in 1987, they fell into the possession of her daughter, Lillian. It was almost 20 years later when I knocked on the door and wanted to see photographs. I found the goldmine when she pulled out these albums. 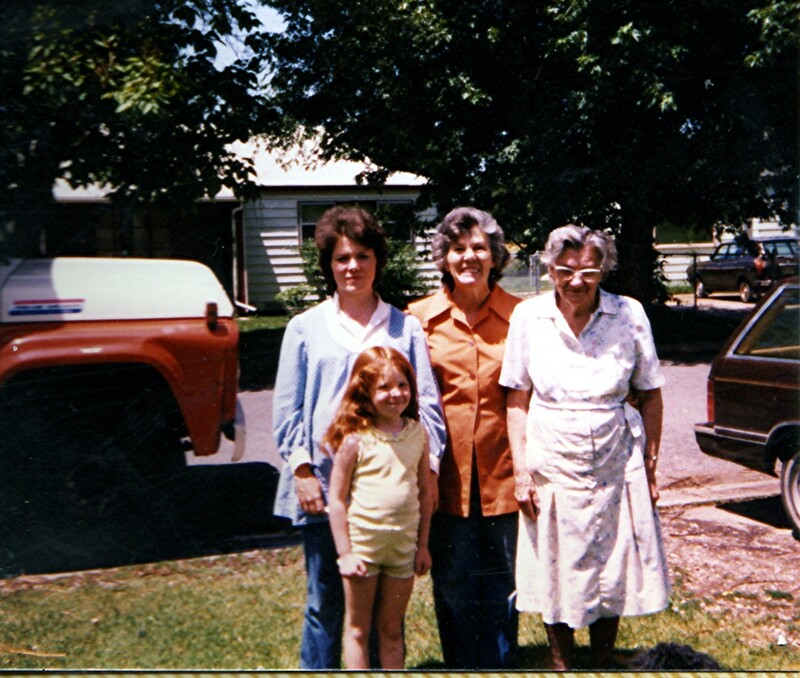 I scanned the photo above in 2006, but after Aunt Lillian passed away in 2009, the family thought to give me this actual photograph. 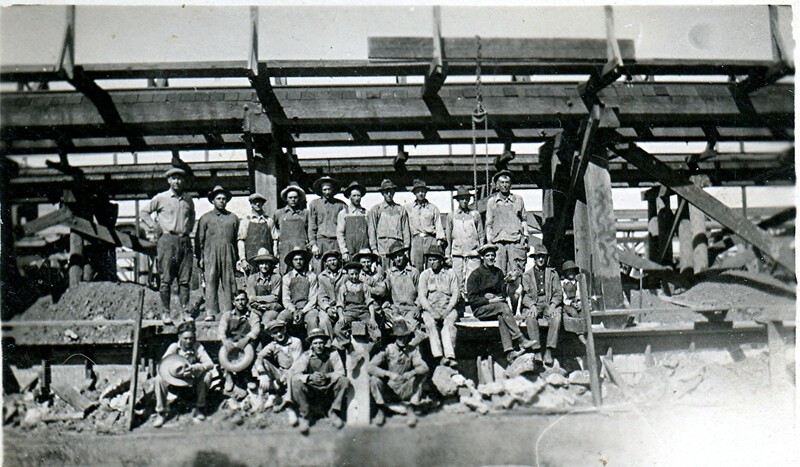 A copy of this same photograph hung in my Grandmother’s house in Paul, Minidoka, Idaho. It sat on a cedar chest in one of the bedrooms. 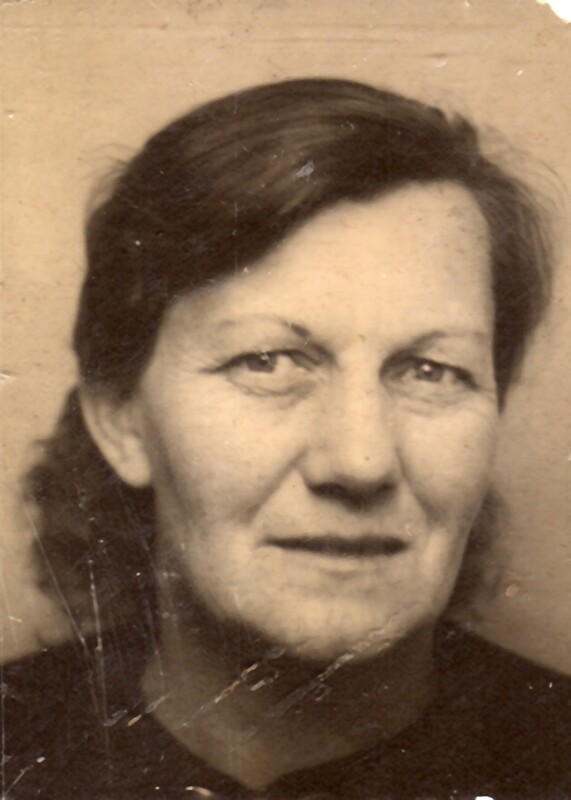 I do not know what happened to that photo when my Grandmother died, but I have this image in my mind of that photo being in my Grandparent’s possession from the late 1950’s as well. Tended, loved, and on the wall overlooking the family as they grew through the years. I know I probably romanticize it as any child does to ignore the pain of their childhood for the faults and inadequacies of their parents. I know my mother romanticizes her childhood and the relationship with her parents. I see in this picture a happy smirk and a couple of contented children. 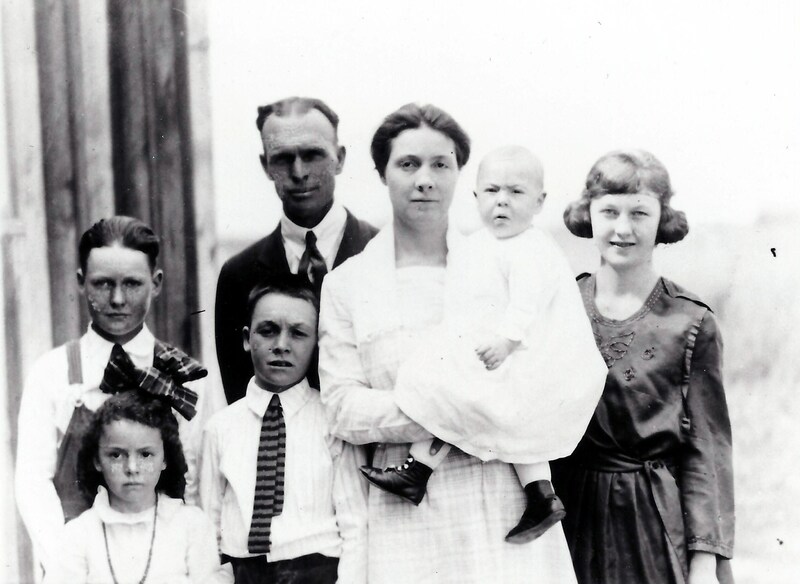 What did my Grandparent’s see in their children? 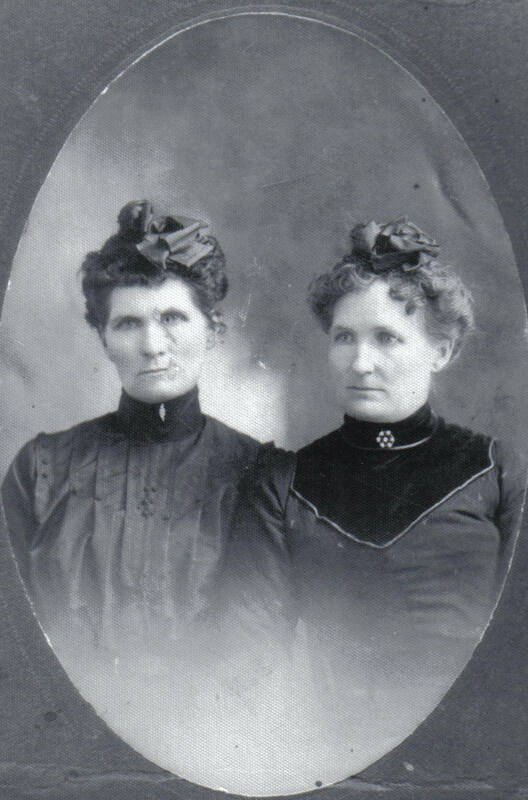 What did my Great Grandmother see in this picture? I will not likely know while I am alive. As I now have a child of my own and feel great love in the features and form of the child, not to mention the personality, I know how I feel looking at pictures of my daughter. I assume my Grandparents felt the same for their children. I look at this photo with new eyes, especially where I can sense so many similar features between my daughter Aliza and her Grandmother Sandy (and even a few with her Grand Uncle Doug). 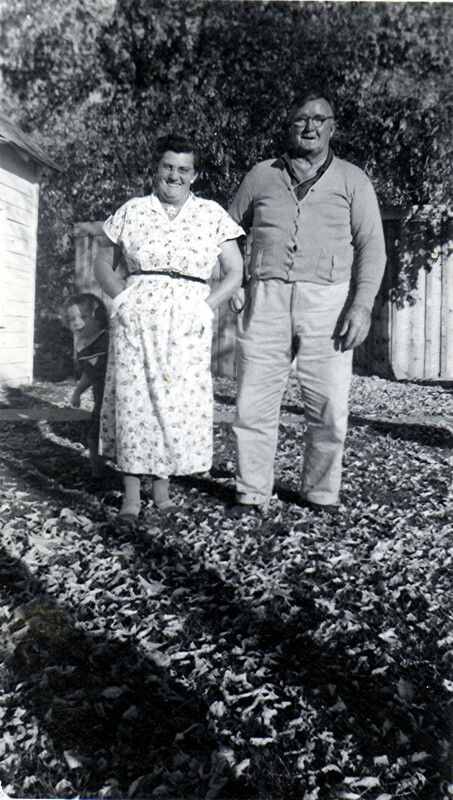 Here is another picture of Mom and Uncle Doug outside their home in Richmond. 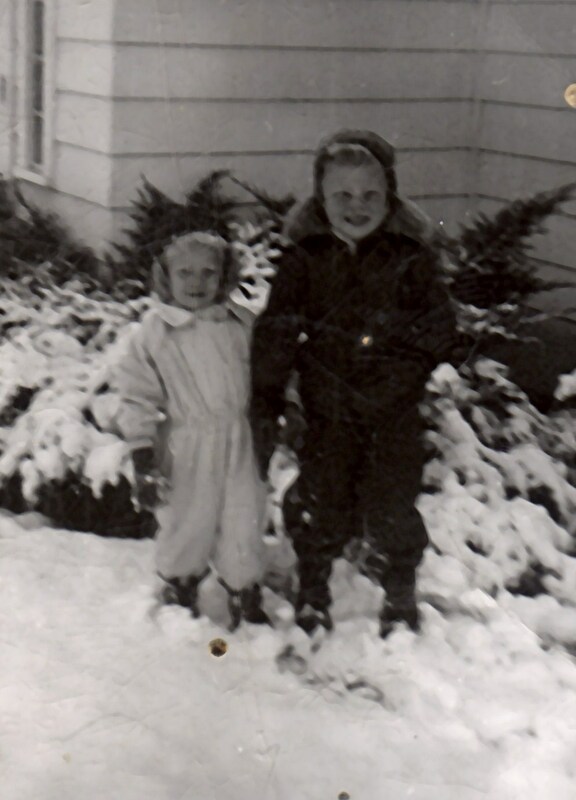 Again, I see two cold, but happy, kids playing in the snow outside the home my Grandpa Jonas lovingly built for the family in the late 1940’s. 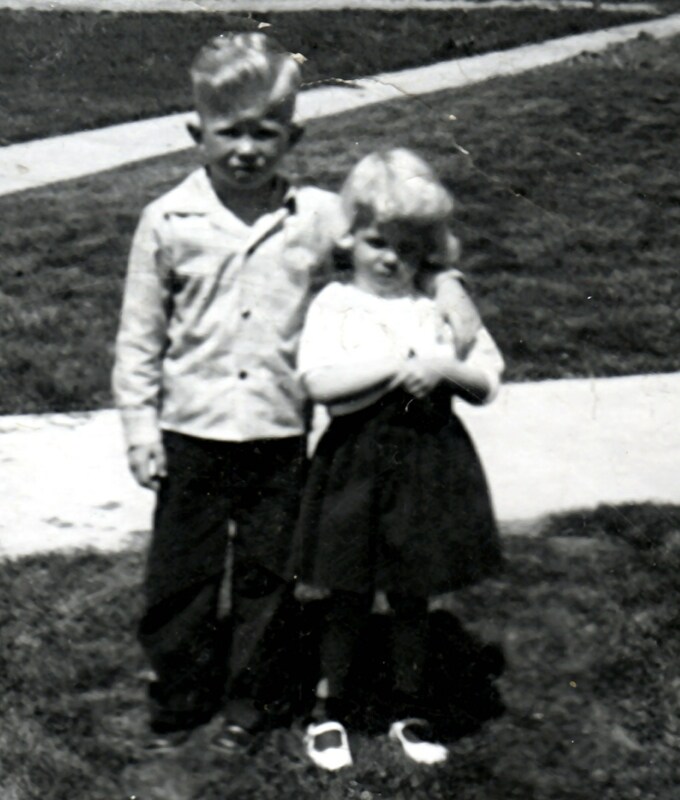 Here is another photo of Doug and Mom outside the Richmond home near the front sidewalk. This photo does not look quite so happy. Mom looks like she is in the same sweater as she was in the first picture above. My Mom had a pretty mangled right-handed ring finger that had not been removed by this point. I imagine she is holding her right hand to hide the the bandages and injury to that finger. That seems to expand my sympathy for her and the somber look she has on her face. No three- year-old should have that type of injury and then keep a mangled finger for 5 years when it finally has to be removed due to doctor negligence and improper care. I think she would have lost it anyway, but the doctor certainly sped things up. 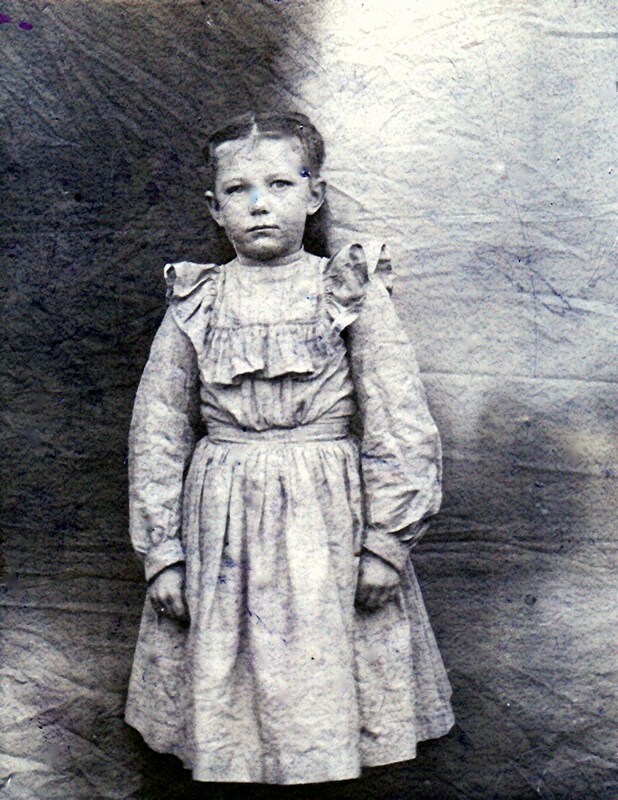 How did my Grandparents view this little girl who was injured? I am sure they loved her dearly. 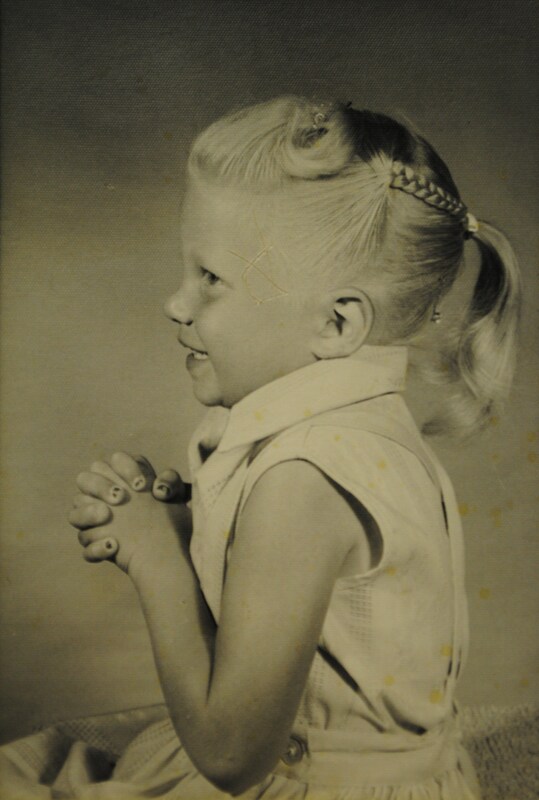 I remember one time after asking my Grandma how she felt about my Mom as a little girl and she referred to her as “her little darling girl.” I am sure it was with heartbreak that this little darling girl now had to live with the pain of a lawnmower almost removing a finger. I am sure a sigh of relief that only one finger was lost rather than all of them. Here is another picture. 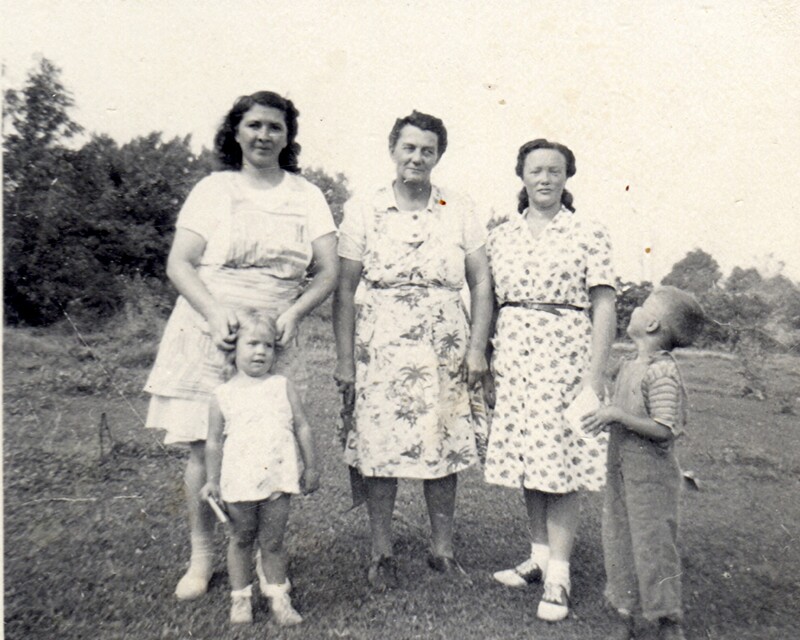 This was also taken in 1957, the same year that Mom would suffer the severe trauma to her finger. She still has it in full glory at this point. 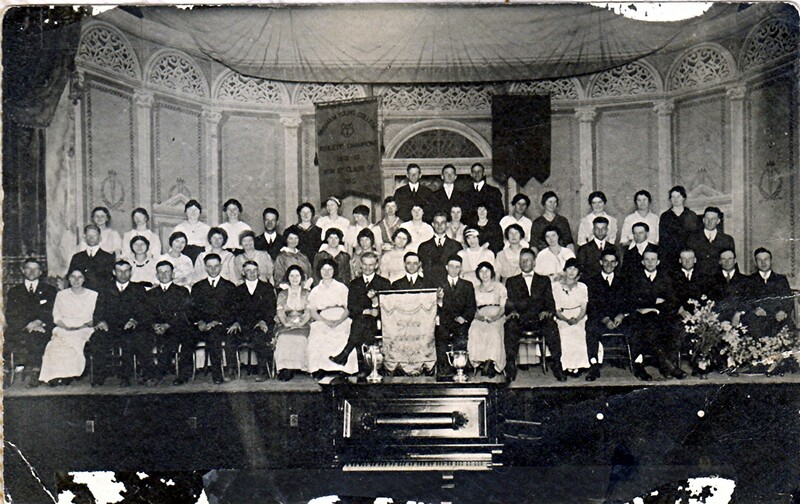 This picture was from the Andra Reunion which I believe was held in Preston, Franklin, Idaho. Again, I feel for the family. I sense a contented nature in this picture. Grandpa did not have his life increasingly taken over by alcohol by this point. He looks like a good healthy, strong man. I love the classic late 1950’s clothing they all sport. 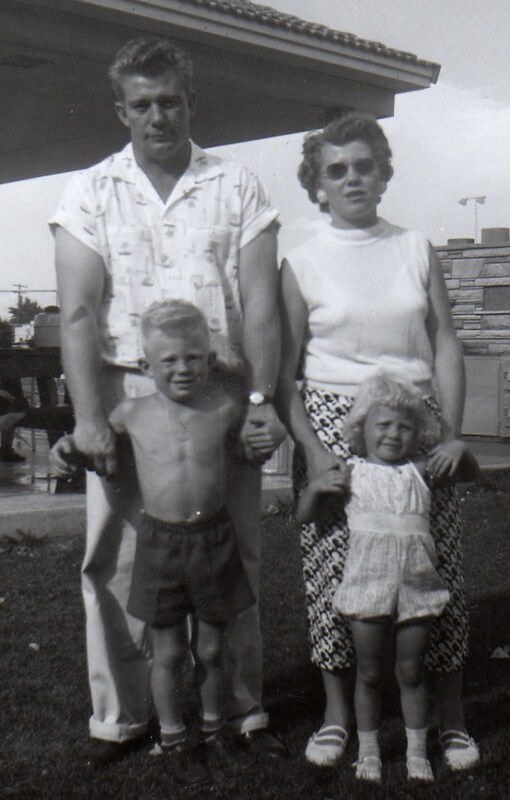 Doug’s ironed shorts, the patterns in Grandma’s pants, the shirt Grandpa wears with the sleeves rolled, and the one piece jumper Mom wears with its pattern. 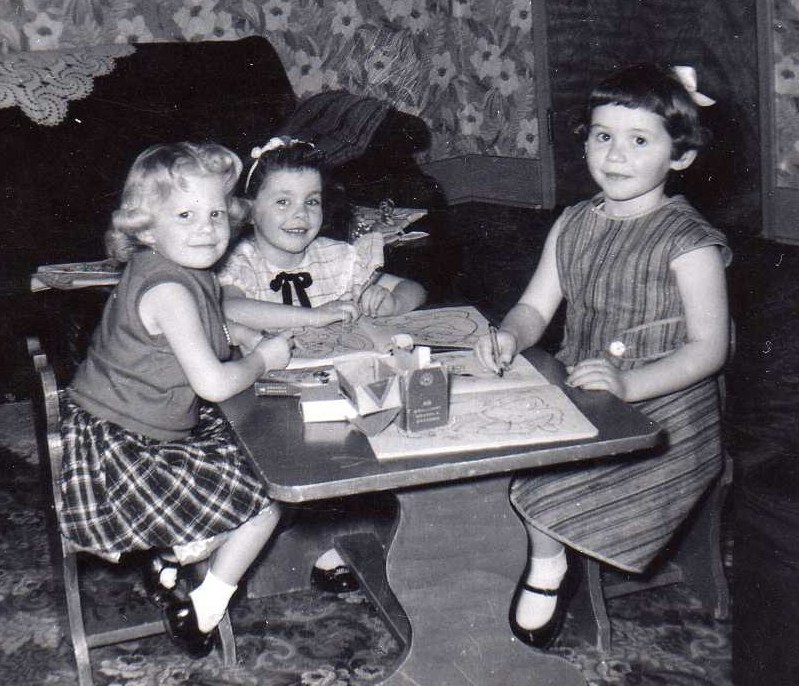 Here is a picture of Mom playing with some friends. 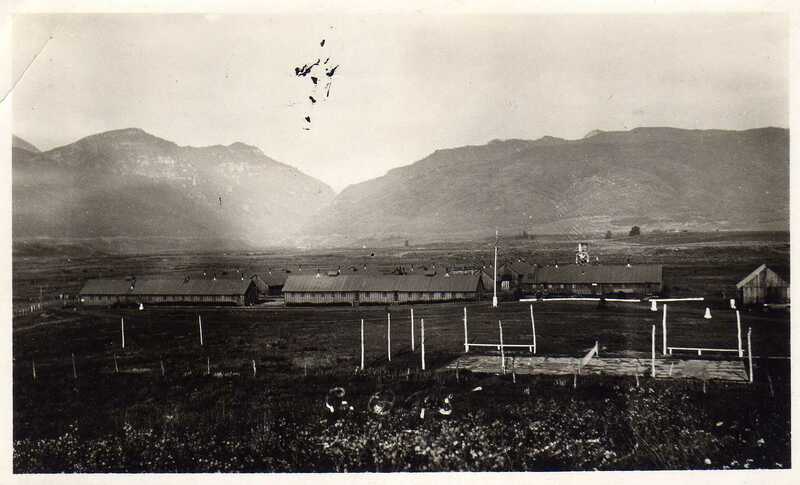 This picture was taken or developed in August 1958, at least that is what the side of the photograph said. Classic wallpaper, carpet, and clothes of the late 1950’s. I especially love the Crayola crayons box on the table. I wonder where these other two ladies are now and what their impressions of the photo and others are? 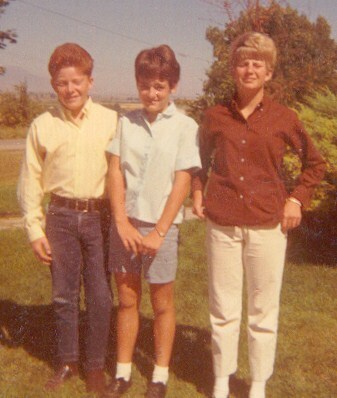 Last picture of the childhood of my Mom. This one is probably my favorite. This photo is also classic of the time with its painted colors. 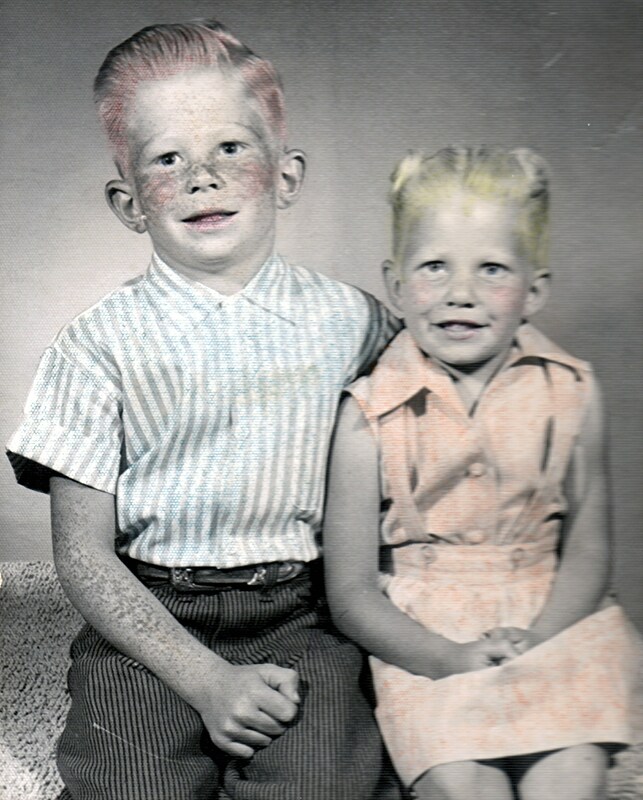 This is obviously a couple of years later, probably even into the 1960’s. Too bad it is slightly blurred, but at least I have it. Oddly enough, the same photo appeared in black in white just this year with this accompanying side shot. A happy child lovingly tended to and cared for. The years fly by until we hit about 1966. The family’s time in Richmond was slowly drawing to a close. 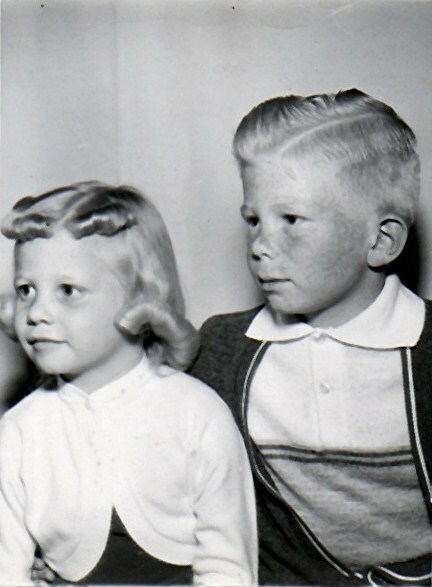 Although by this time a younger sibling, Jackie, has joined the children. 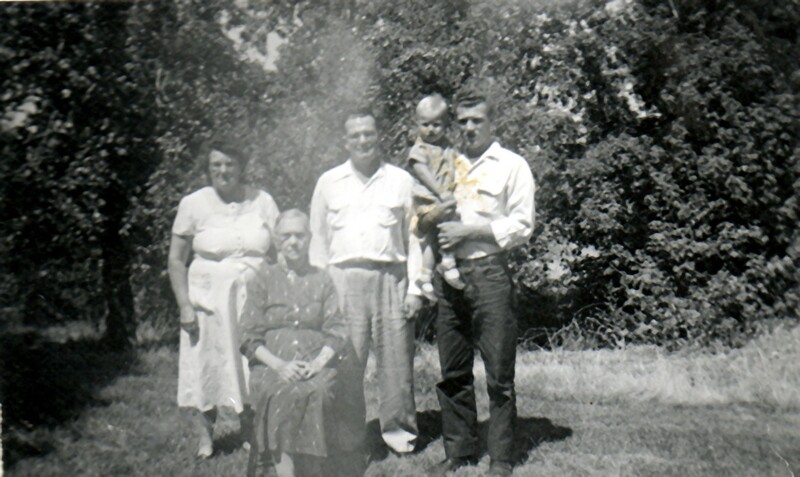 Here is another picture from about 1968, probably shortly before the move to Burley, Cassia, Idaho. Sally (1955-2010) was Mom’s best friend growing up. Dee is Mom’s first cousin. 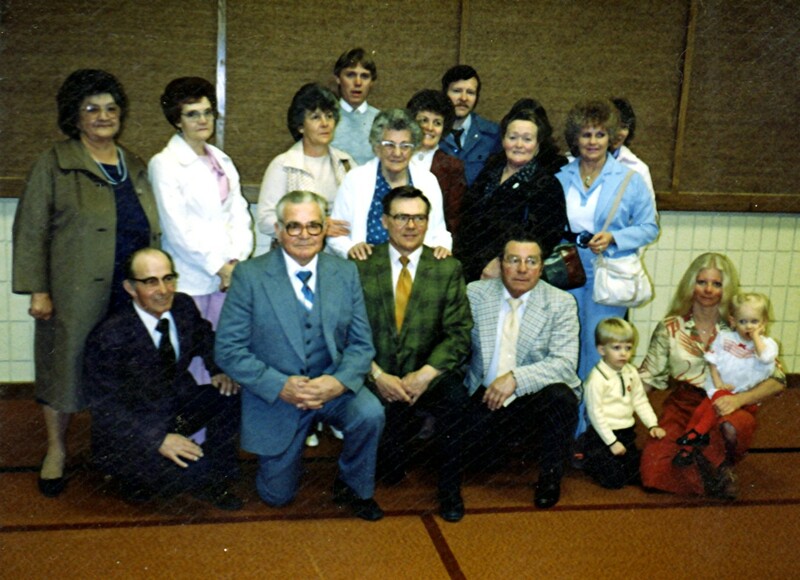 The family moved to Burley in 1968 when Grandpa secured work on the construction of the new Del Monte plant. I know Mom was not at all excited about the move. At this point, I think I will leave Mom’s time in Idaho for another time. But I have at least documented some of her life from 1954 through 1968. 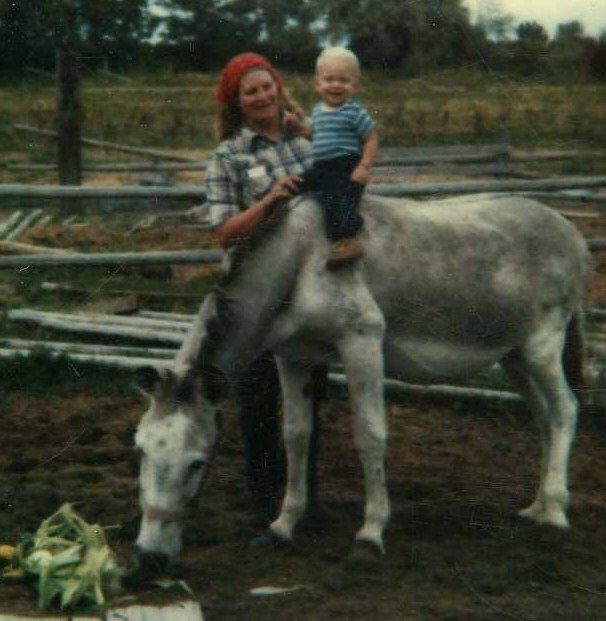 One last picture of Mom and me around 1980. 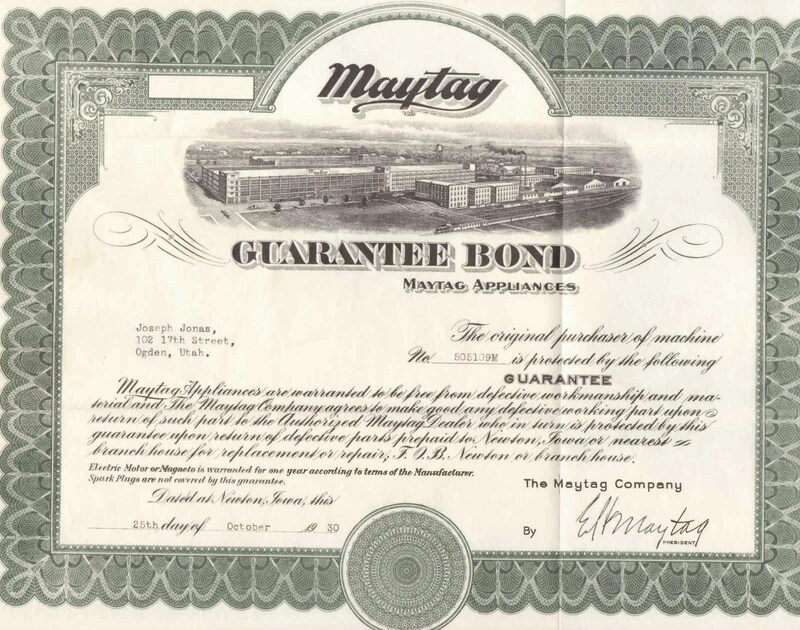 I am republishing this old post with a pretty cool little update. I first published this post on the 26th of October 2006. I am happy to report that while the trunk was not located, its contents have been! I will not disclose where these contents were found, the important part is that family once again has these items. Future posts will start to share these contents as I have the opportunity to review, scan, and make it available. There are some pretty cool, and useless, items in these contents. Everything from tokens obtained in Cigarette packs for Hoppie’s Billards in Richmond, Cache, Utah to a stash of photos that I can only hope we can name all the individuals captured. Calendars from 1934 to mail received in the 1940’s. 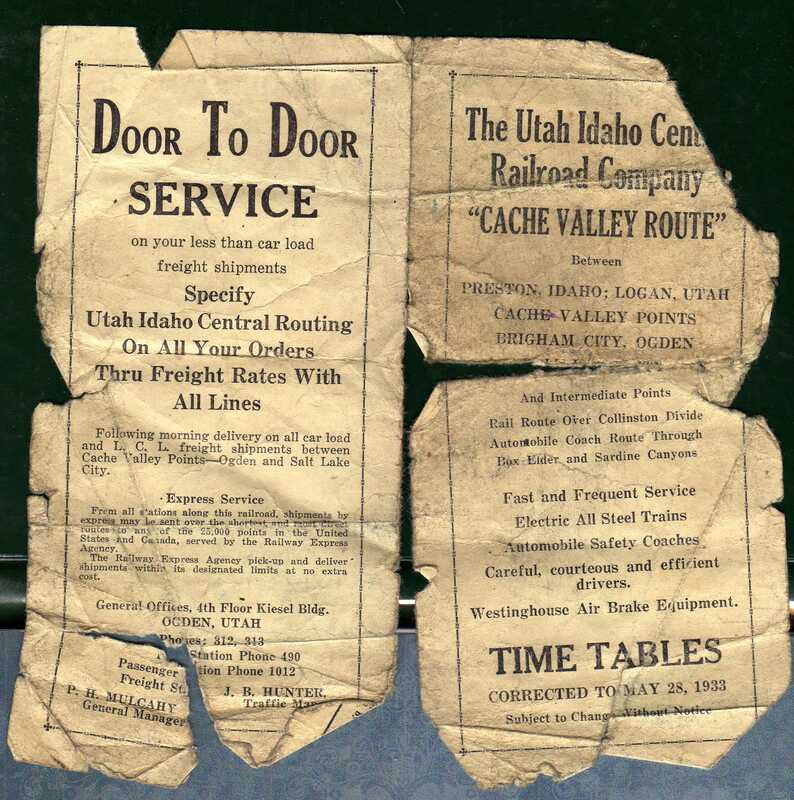 Telegrams regarding the bringing of a body home (9 years after dying in World War II) to receipts from the Benson Stake (Richmond, Utah) Tithing Office. Franklin Institute flyers from 1930 to a wallet of my Great Grandfather containing receipts from the day he died in 1932. This will be fun. None of the journals have been found yet. The flag from her son’s coffin is not present (yet). The person is still looking to see if there are more items, which I hope there are. 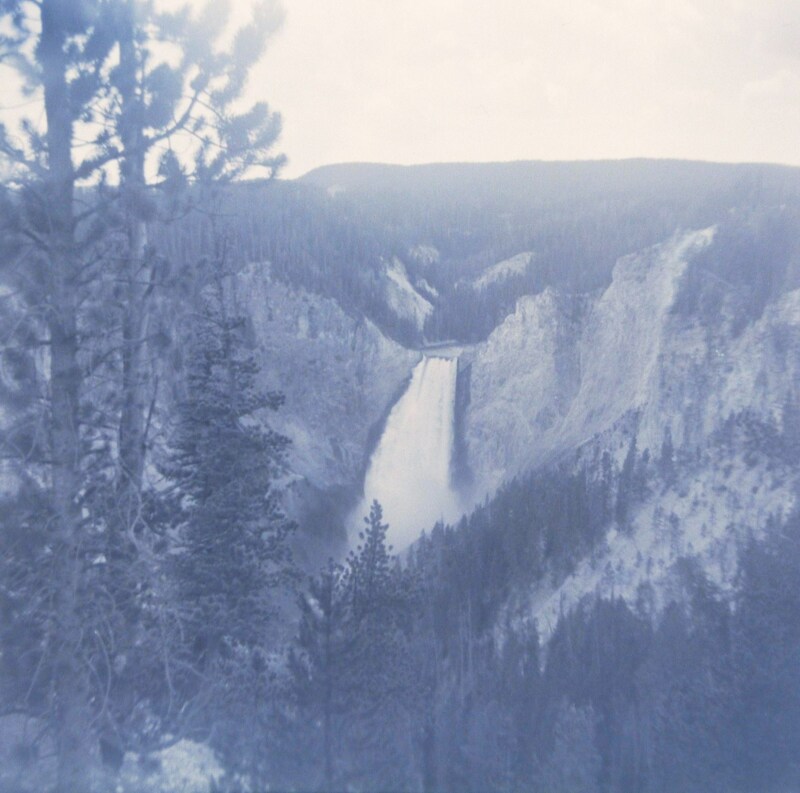 As a taste, here is a photo from a negative found in the contents of Yellowstone Falls. Thanks be given for this modern miracle. will be manifest. I ask that those who read would offer up a prayer and hope for the same. 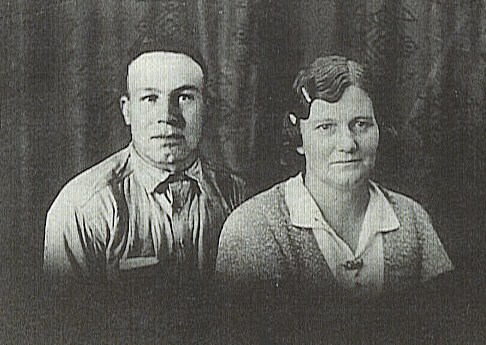 In 1932, Joseph, her husband was electrocuted working for the railroad in Ogden, Utah. 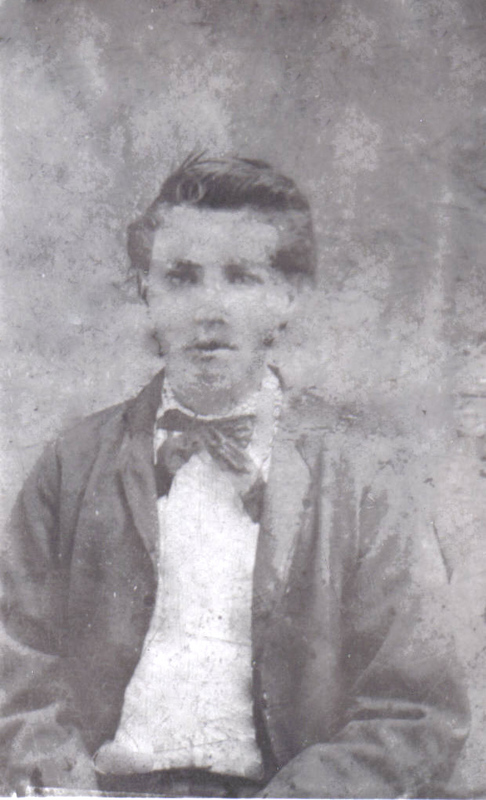 His father had worked for the railroad, and most of his family also worked for the railroad. 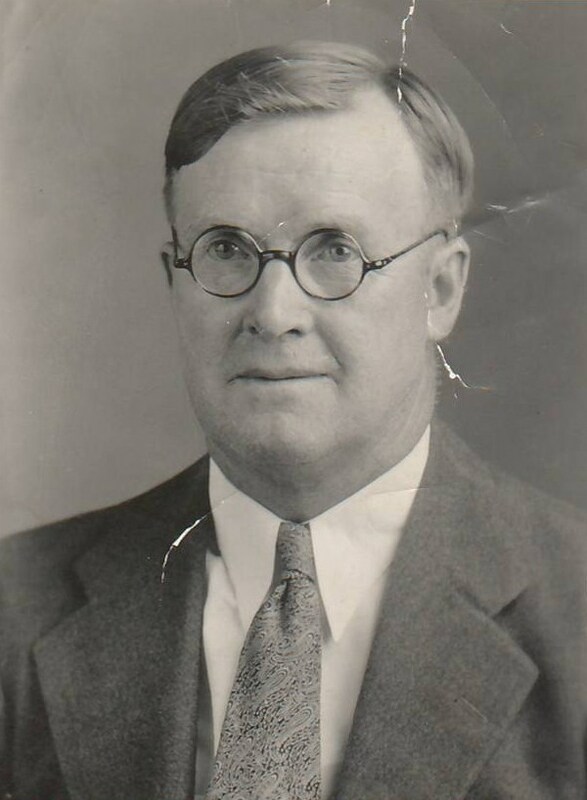 He was made manager and had moved to Ogden from Richmond only a year or two before. The family moved back to Richmond. 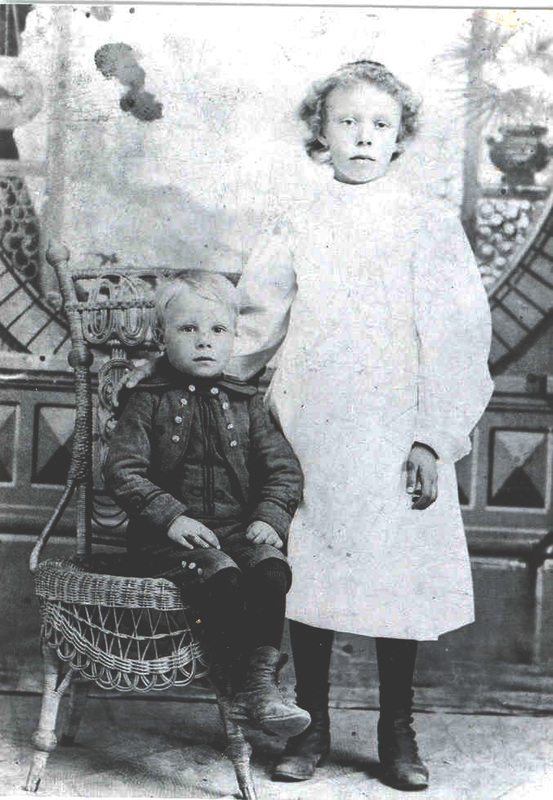 Lillian then did her best to raise the boys. 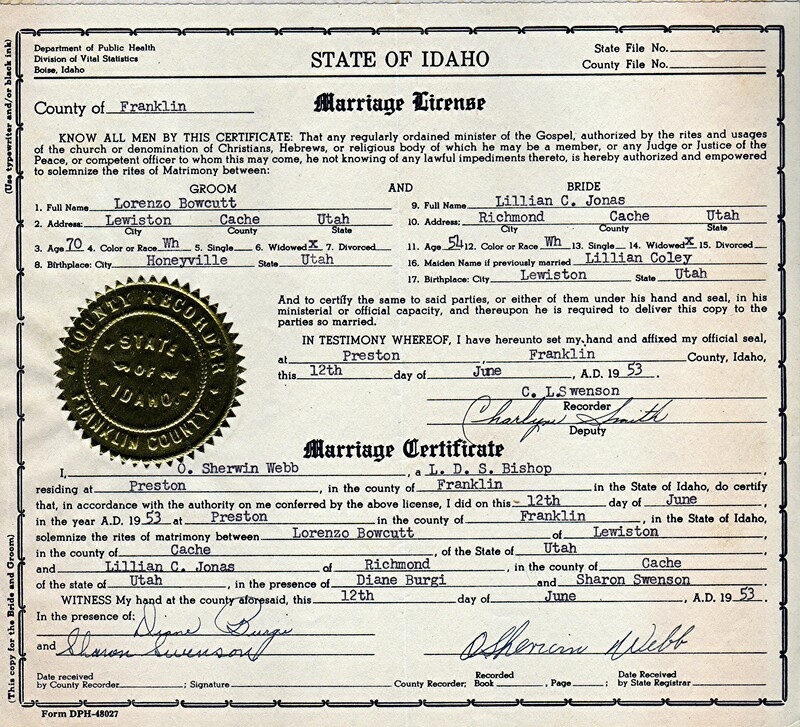 She remarried in about 1959 to Lorenzo (Ren) Bowcutt in Preston, Idaho. 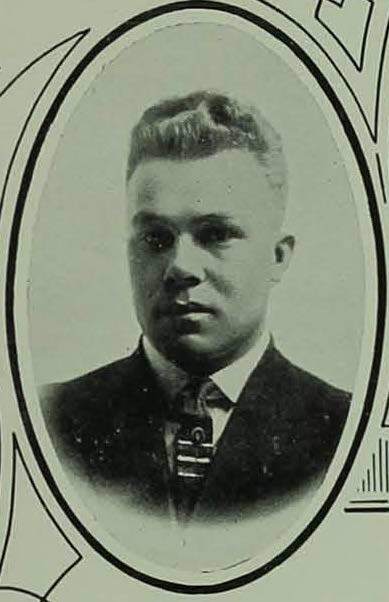 Ren died in about 1966. 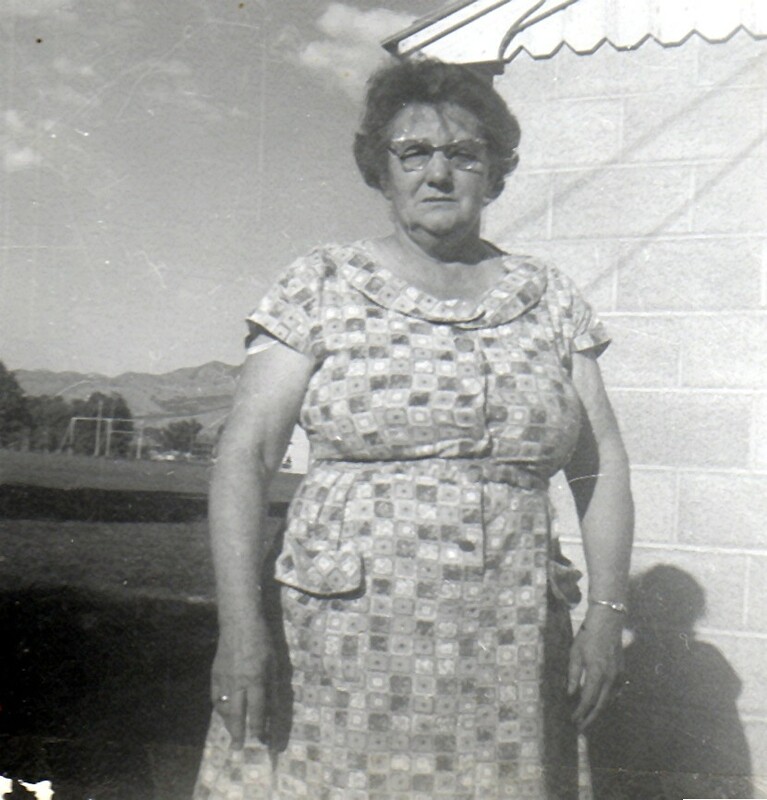 She lived alone mostly until the mid 80’swhen she moved in with her daughter, Lillian, in Layton, Utah. Here is the reason for writing. Through all these years, she kept a trunk with personal possessions. 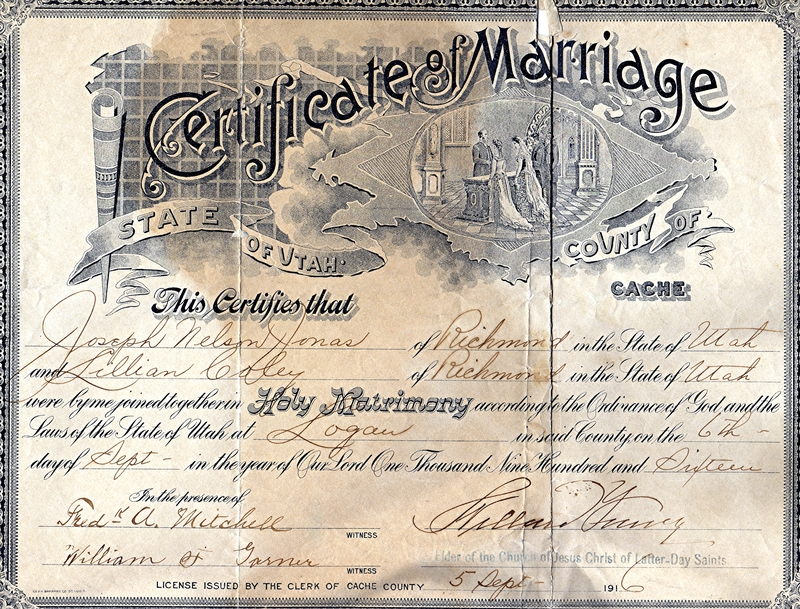 Contained therein are the birth certificates of all her children. We know she kept journals through most of her life in calendar books issued by the insurance companies. There are at least 10 of these journals in the trunk. There are a couple photo albums that were hers and her mother’s. Also there is the flag that draped her son’s coffin after his death in WWII. There are apparently some books that came over with her grandfather from England. trunk. I only remember it being placed in one of the upstairs bedrooms of my grandmother’s house and we were forbidden to look in it. She placed a television on it when we were younger to keep it from younger hands. It sat in that same space, even until I left to go to England for my mission. 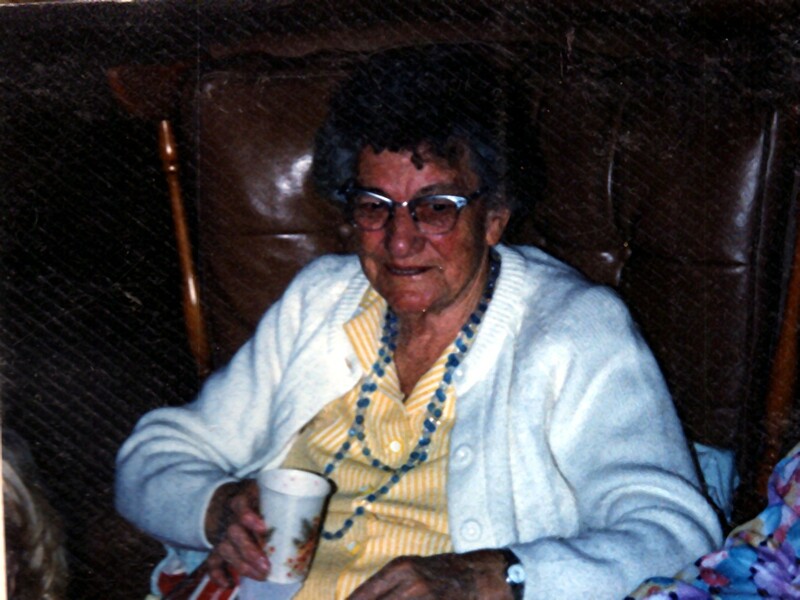 In 1999, she died, and shortly thereafter, somebody broke into her house. The trunk is one of the objects that were stolen. My aunt was living there at the time but insists she has no idea who made off with it. She thinks it is somebody she knew or knows. There might be other items that were taken, but the official inventory was not taken for another week or two afterward. Here is the plea to those who come upon this blog. If you are searching for the owner of the trunk, please contact me. 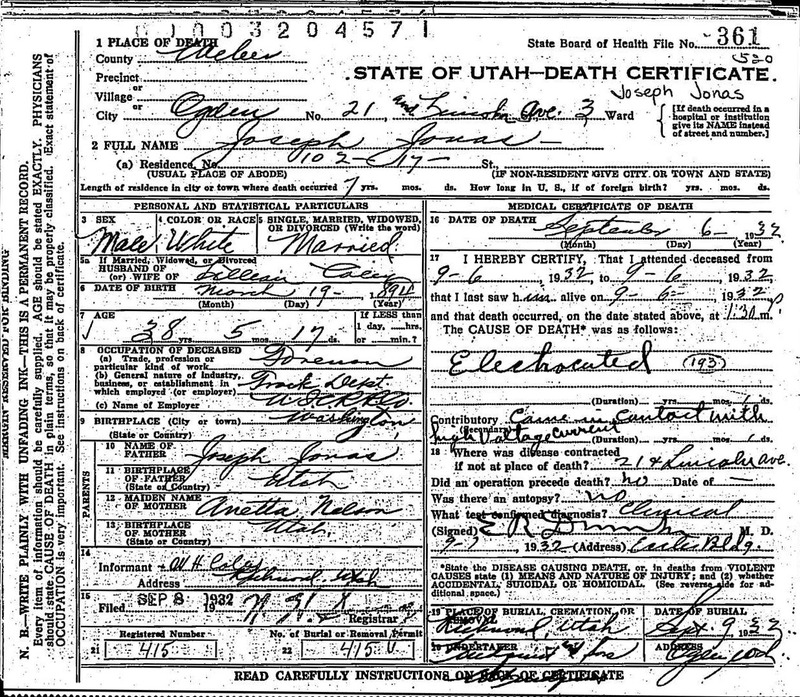 While there are no individuals who would possess the names in the trunk in Southern Idaho, I hope you stumble on this blog. There will be no questions asked, we just want the inventory, any of it. If you are just reading and can understand the plight, please offer a prayer to heaven in our behalf that this priceless gem is returned to those who would honour and cherish it. This is a deep and sincere desire of my heart. I am writing from sunny and green Idaho. The amazing thing is another rain-storm is pondering the roll through right now. The reservoirs are all full and life seems to be looking pretty good here. The locals say it has been a bit humid for the past few days, but I can handle 20 or 30% humidity with little issue. Especially after 100+ Oklahoma with a heat index into the cent teens. I thought I would share a couple of thoughts of our little trip. This morning found us at the bright and beautiful Twin Falls Temple. I will have to post some pictures later, but it was a full session. It was a clear morning and we could not have asked for more. We ran into my cousin on the session and it was fun to catch up with her. We took some pictures after we got out as Dad and Jan were going in. Amanda needed some R&R so we came back and crashed for this afternoon. We did have lunch with Ms. Felicia Poteet and her cutest daughter, Evie. I am glad I have friends, that I get to hang out with them, and learn from their life experiences. Where would we be without family and friends? The week was busy getting Derek off into the MTC (Missionary Training Center) in Provo. All went off, pretty much without a hitch, on Wednesday. 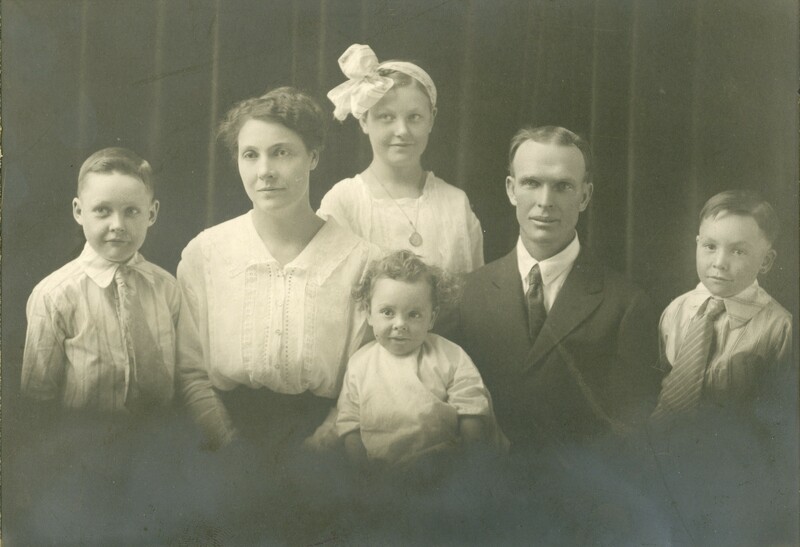 His farewell went well, he spoke well, and the family congregated to the Hemsley home in Kaysville. All enjoyed the food, spent some good quality time with family, and plenty of stories. I was exhausted after the whole thing and I didn’t even have a role to play in the open house. There must have been 50-70 people who came through the home during the open house. We helped Derek pack, finish shopping, fulfill a few last requests, and enter the MTC. We also had a meeting or two with friends of Amanda’s from high school to catch up on old times. We stopped to visit Amanda’s Grandpa in Springville, Utah as well. We drove up to Idaho yesterday but took our time doing it. We took the old highway from Snowville up through Strevell, Bridge, City of Rocks, Oakley, and home. Everything was so green from all the rain and it looked good. We enjoyed the drive. We took some pictures of the old homes in Elba, Idaho. 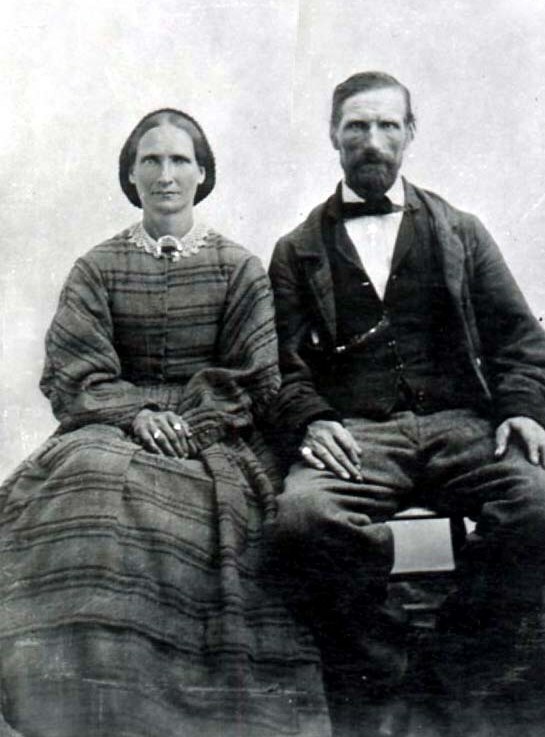 Someday we want to design our own home with a design that is both unique but that has some classic designs, one of which is found in the early pioneer homes. Tonight we head off to a melodrama at the restored Wilson Theatre in Rupert. Tomorrow morning we have the Scout Breakfast at the Rupert Square and then we will watch the parade. Tomorrow is also Dad’s birthday. Jan’s was last week. We treated them to dinner last night and the show tonight. I am certainly looking forward to the parade. Then we drive back down to Kaysville to watch fireworks at fly out Sunday Morning. 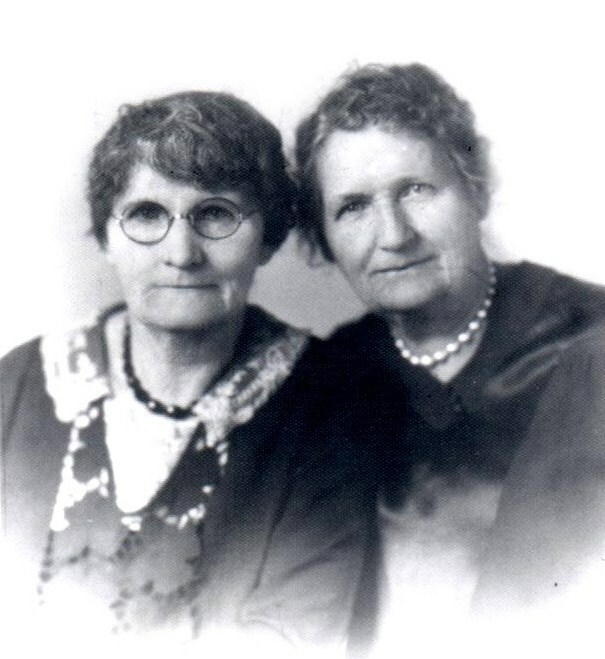 I am happy to now make available the journals of Lillian Coley Jonas. I know I have mentioned them earlier, but this blog site did not have the capacity to link a file at that time. They were too big to place the entire journal’s text online. 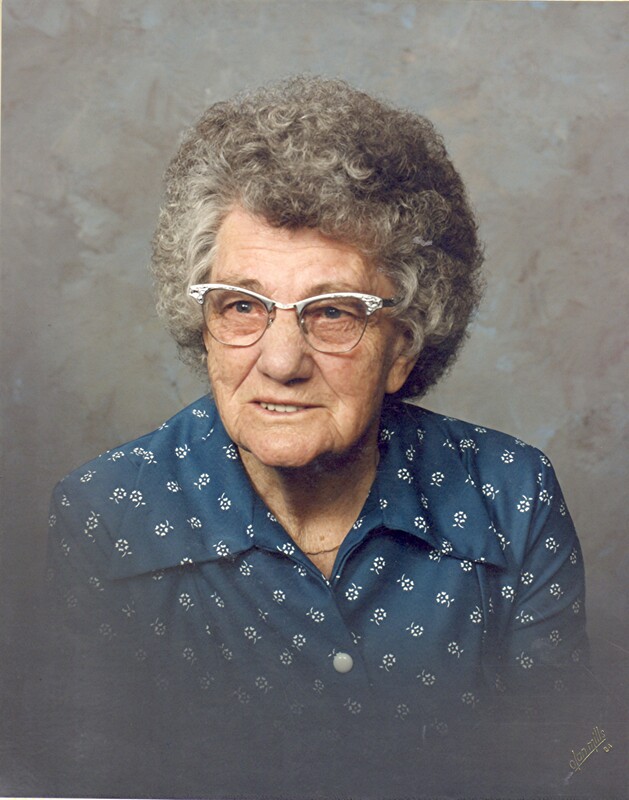 Lillian Coley Jonas was born in Lewiston, Utah in 1898 and died in Layton, Utah in 1987. 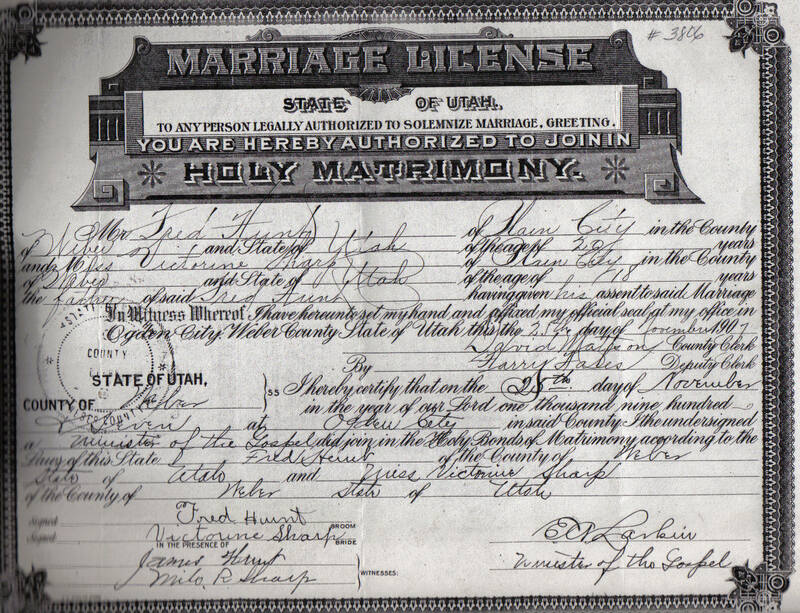 She married Joseph Nelson Jonas in Logan, Utah in 1916.